Windy. Mostly cloudy skies will become partly cloudy after midnight. Low 47F. NW winds at 20 to 30 mph, decreasing to 5 to 10 mph. Winds could occasionally gust over 40 mph..
Windy. Mostly cloudy skies will become partly cloudy after midnight. Low 47F. NW winds at 20 to 30 mph, decreasing to 5 to 10 mph. Winds could occasionally gust over 40 mph. Santa Maria Northside players and coaches pose for a photo after winning the Little League District 65 8-9-10-year-old championship Monday evening at Johns-Manville Park in Lompoc. Northside defeated Los Osos Coast 8-5 to win the title. 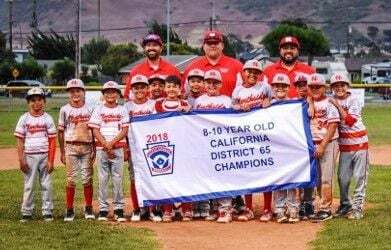 The Santa Maria Northside Little League squad defeated Coast Little League 8-5 Monday night at Johns-Manville Park in Lompoc to win the District 65 8/9/10 Tournament championship. Northside starter Joevanni Ortiz earned the win, giving up no runs and one hit over his four innings of work. He struck out five. Ivan Enriquez went 5-for-5 for Northside, which rallied after spotting Coast four first-inning runs. Northside scored five times in the fourth inning and tacked on three runs in the fifth. Coast scored a run in the top of the sixth, but reliever James Fakoury closed out the win for Northside. After helping the Hancock College men's basketball team reach the Elite Eight of the state tournament for the first time in 44 years, Devin Davis has signed with Hays, Kansas-based Fort Hays State, according to a Hancock-issued press release. Fort Hays State is an NCAA-Division II program. According to the Hancock release, Fort Hays State gave Davis a full scholarship. "This is a dream come true," Davis said in the release. "Ever since I was a little kid, I dreamed about playing basketball at a four-year university," said Davis. Davis, a 6-foot-3 guard, transferred to Hancock last year from Colorado Northwestern College. Davis averaged 11.2 points and 7.2 rebounds a game for the Bulldogs and earned a spot on the All-Western State Conference First Team. Davis made the Hancock Dean's List in the fall and spring semesters of the 2017-18 school year, with grade point averages of 3.5 and 4.0 respectively. Righetti High School has found its next baseball coach. ERHS Athletic Director Kevin Barbarick told the Times that Kyle Tognazzini has been hired to take over for former longtime coach Brian Tomooka, who has moved over to coach Righetti's softball team. Kyle Tognazzini has worked with the program the last two seasons, coaching the JV baseball squad. Tognazzini is a Paso Robles High School graduate who played college baseball at Cuesta and then Lipscomb College for two years as a pitcher. He's also coached for the San Luis Obispo Blues. Tognazzini will continue to teach at the school. The Santa Maria Reds have scheduled a Cancer Awareness Day for their 1 p.m. game July 14 against the Santa Maria Valley Packers at Elks Field. The organization has scheduled Cancer Awareness giveaways during the game and will hold a 50/50 raffle. According to a Reds-issued release, proceeds from the raffle will go to Mission Hope Cancer Center in Santa Maria. The Lompoc Recreation Division is holding three pickleball clinics on the Cabrillo High School tennis courts. The class will run from 9 a.m. until 10:30 a.m. on Saturdays, July 14, 21 and 28 for anyone age 16 and over. Cabrillo High School baseball coach Jonathan Osborne will lead the clinics that will teach the basics of the game. Pickleball is a racket sport that combines elements of tennis, badminton and ping pong. It is designed for two or four players with the game played on a badminton-size court using solid paddles made of wood or composite materials. The cost is $25 for residents and $30 for non-residents. For more information, contact the Lompoc Recreation Division at 805-875-8100 or go online at www.cityoflompoc.com. Billy Vinnedge will hold his eighth annual BVKA Camp Saturday and Sunday. The two-day camp will be held in Nipomo starting Saturday. The sessions will start at 9 a.m. and end around 4 p.m. Registration can be made through Vinnedge's website: www.bvkacamps.com. Campers can sign up for both days or just one full day. The camp will include instruction, charting and competitions as well as a camp T-shirt and water bottle. The camp is open to junior high through college athletes.